The product review I am doing today is for the Cobra JumPack XL H2o. 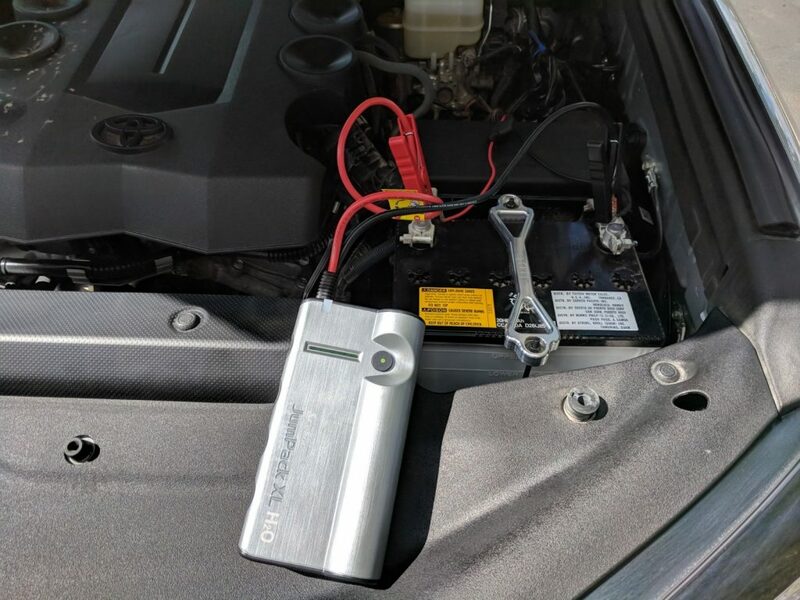 I bought this product in the event that my battery goes out on a trail and there is no car nearby to jump start, this little portable pack will be a lifesaver. The size of this pack will compliment your jumper cables in case you are stranded alone with a dead battery, which can easily happen for those who do not have common upgraded batteries or dual batteries in their rig. There are many options online when choosing a battery jump starter, from large battery packs to small portable ones. After talking to some fellow Vegas owners, they all recommended the Cobra pack as it was field tested by many truck owners. What makes this pack even greater is that it is semi-waterproof and also contains multiple USB chargers for phones, tablets, etc. 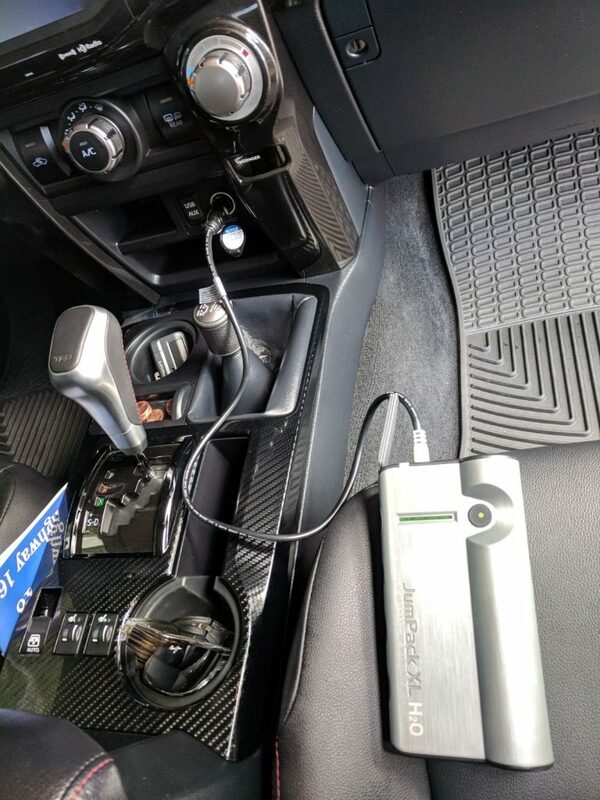 Another benefit is that you can jump-start your car from the inside or the outside using either the jumper cables or 12v accessory port. Perfect for days of bad weather. 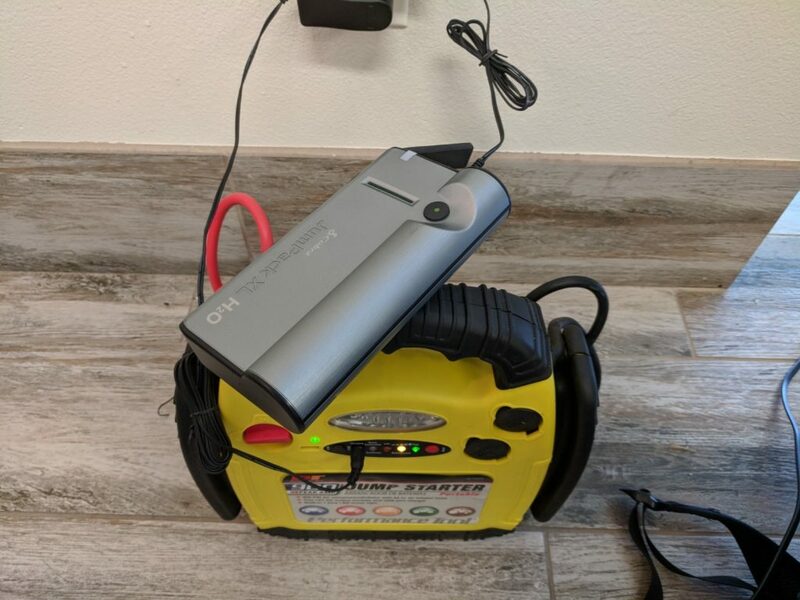 From the photo above, you can see it isn’t a big portable jump starter. I bought the charger on Amazon for and it arrived to me in a few days. The box contains all the contents you will possibly need to jump your battery on your 4Runner. Right out the box, the battery has 2 bars of juice left. The amount of battery left is quite easy to tell with the push of a button. According to the manual, 2 bars mean 40 – 65% charge left. I would like to mention that the battery pack does not feel cheap. It may be Chinese made, but not cheaply Chinese made where it will break after a drop. The feel of the battery is quite good. This battery pack also works on both gas and diesel engines, up to 8 cylinders. 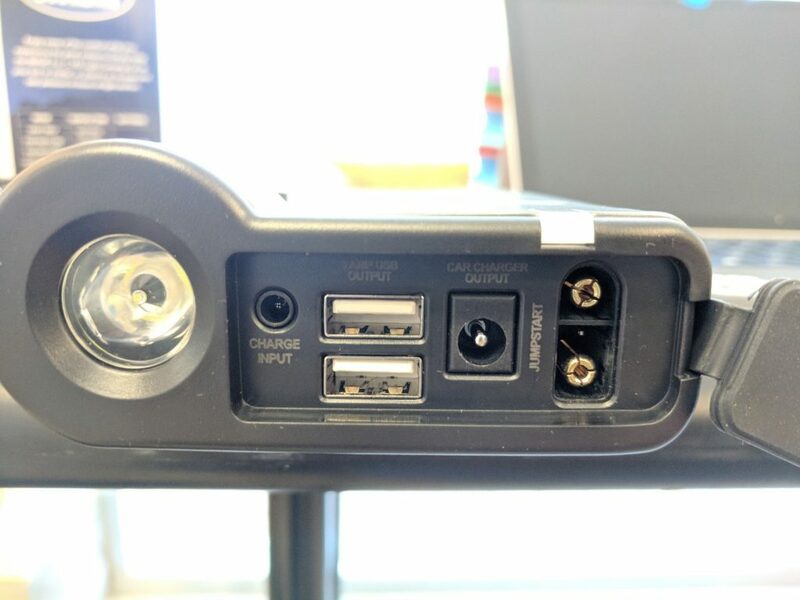 You can see the flashlight along with all the labeled ports that you can use. And, another angle with the ports opened up. For those wondering, the battery is bright enough for use. 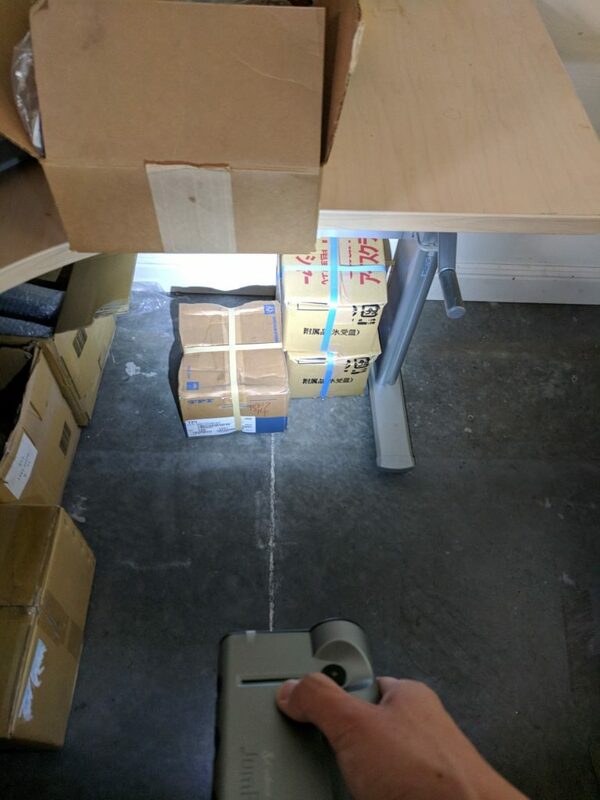 I tested it in my warehouse and it was quite bright. There was also different modes where you can flash the lights for emergencies. All I had to do was connect the jumper cables to the battery and start the car. My car battery was not dead so I did not jump it, but you can see from the pictures that it was ready to be jumped. There is a LED indicator on the pack that tells you when the car is ready to be started. On the top right of the pack, there is a tri-color status LED that gives you a mini diagnosis of the battery pack. I will not list all the lights here, but basically, it tells you when there is reverse polarity, jump pack is depleted, transferring of charge, ready to jump, and other codes. Remember to turn your ignition to OFF before jumping. No need to pop the hood! Crazy! 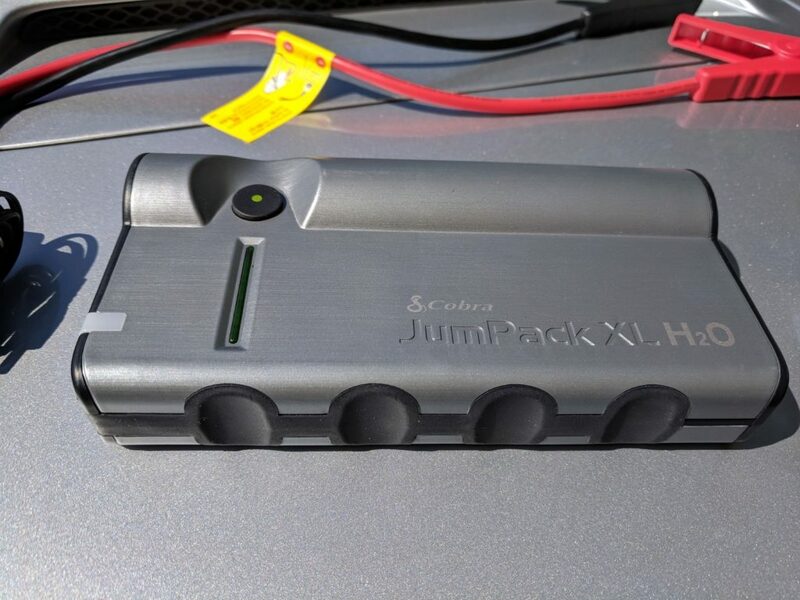 A good feature for this jumper is that you can also jump from the 12V accessory outlet inside your 4Runner. 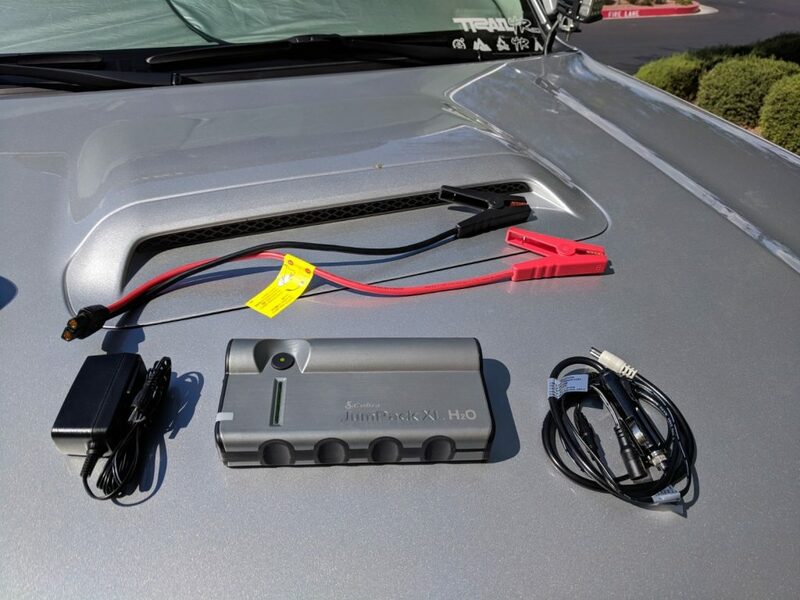 For people who (hopefully not) don’t feel confident on touching their battery terminals or know how to jump a car, you can just basically plug the pack into your 12V terminal and it will jump from there. 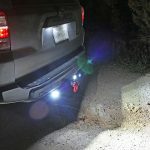 This is also handy when you are in snow or rain, you won’t have to get out of your car! 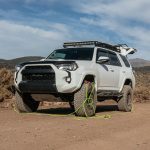 For 5th Gen 4Runner owners, we have multiple 12v accessory jacks around the truck, you can use whichever one you choose. Charing using the 12v is simple, just turn the ignition to accessory and wait for the LED to turn green, it should be able to jump then. 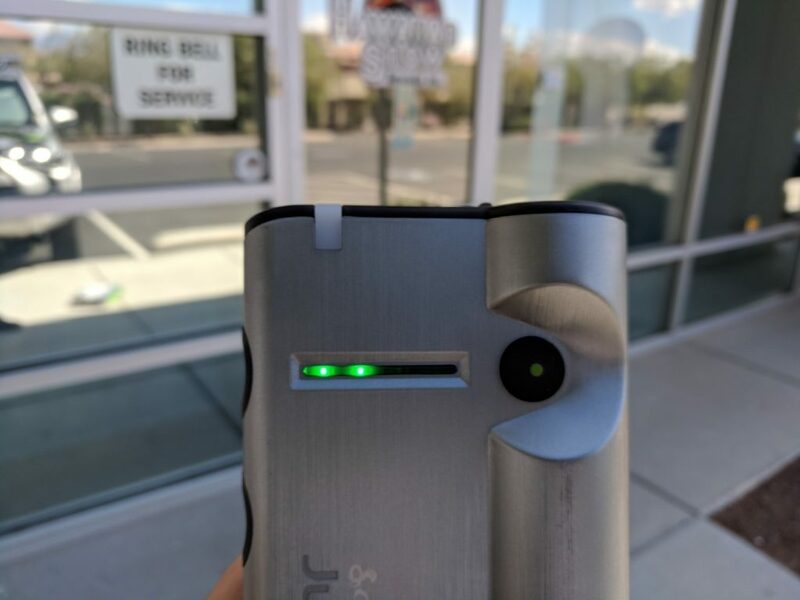 As with jumping from the battery, there are various LED indicators that will let you troubleshoot. If you jump pack makes a clicking noise every few seconds, this is normal. Don’t be alarmed! I went from empty to full in around 4 hours with the supplies 110v charger. You can also charge your pack using a 12v supply on your car. In this picture, you can compare the size of the Cobra pack to a larger 900 peak amp charger. I would prefer to lugging something smaller around and lighter than a full-sized jump starter. I was quite impressed that it came with a nicely organized carrying case and pouch. The case includes slots where you can put the cables, charger, and the battery pack all nicely zipped up in a leather casing. Luckily, I have not had the need to use this yet, but I feel much safer having this with me wherever I go. It does not take a lot of space or produce added weight. This pack has the benefit of also charging my phone when camping and puts less strain on my battery with misc. accessories when going on trips. 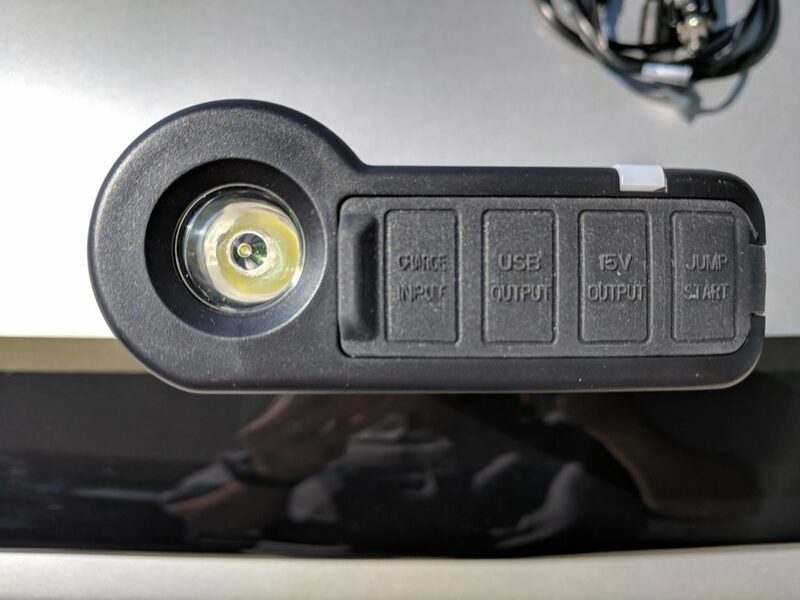 For 4Runners who still run on factory batteries and don’t have upgraded batteries or dual batteries, this is a great additional tool to carry. When soloing trails, you never know when your battery will give out. This has the benefit of being able to jump start your truck to safety without the additional weight or wiring of having another battery. All in all, it is a good piece to have given the price. Questions Comments? Leave them below!